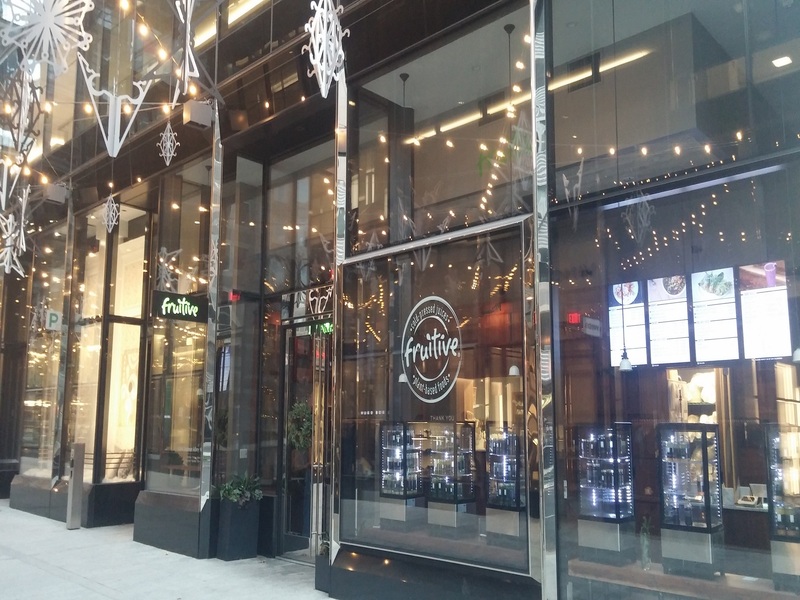 Fruitive, a 100% plant-based, certified organic restaurant located in CityCenterDC, an upscale, outdoor shopping plaza a few blocks east of the White House in Washington, D.C., takes pride in its ingredients (“If it didn’t come from the earth, then it doesn’t make the cut at Fruitive.”). Founder Gregg Rozeboom provides a full description of every item on the menu, including health benefits and ingredients, on the restaurant’s engaging website. Fruitive’s motto is “Live Your Health, Live Your Values.” They had me at their motto. The menu is packed with sustainable, compassionate, and healthy choices: smoothies, juices, fruit bowls, waffles, salads, toasts, tacos, soups, wraps, and sandwiches. When people who eat plant-based dream about food, this is what they see. When I entered, Ryan, the manager, offered a warm welcome and passionately discussed Fruitive’s delectable food and what it means to provide healthy options. She’s genuine and natural and understands the importance of connections–evidenced by her familiarity with customers as they entered. It’s clear she enjoys her job. She has the qualities every restaurant owner needs in a manager. After wishing I could eat everything on the tempting menu, I opted for Ryan’s recommendations: the Sweet Berry Waffles ($9.95) and Avocado Herb Toast ($5.95), and I added a cold-pressed All Greens juice ($7.95). When I took the first bite into the gluten-free waffle, which was drizzled with maple syrup, covered in fresh berries, and topped off with a dollop of whipped coconut cream, I tried to think of a better waffle I’ve eaten. None rose to this level. My taste buds were dancing like they were in Studio 54 with a white jacket on their shoulder. I would walk barefoot for miles for this waffle. With heavy equipment on my back. In the snow. When I finished eating this perfectly dense, crispy on the outside and chewy on the inside marvel, I felt sad it was gone. A few hours later, I caught myself thinking about it. This hearty, generous, certified organic, sustainable, plant-based, somehow gluten-free, made from scratch waffle needs to be entered into a national waffle contest so it can get the recognition it deserves. You’ll devour it and then crave it. You’ll miss it. The waffle came with a plastic fork. How can thee s’rve such a waffle with a plastic f’rk? If Mommie Dearest dined here, she would proclaim: “No more plastic forks!” Sadly, it was not strong enough to cut the waffle and broke. I replaced it with a new fork and added a knife, and merrily resumed devouring this gem, occasionally pausing to chew. But Fruitive is too conscientious to use plastic. In fact, they tout their use of “safe, recyclable, reusable, sturdy, and sustainable” glass for their juice so they get it. The glass also avoids chemical leaching and they offer a $1.00 bottle refund. If feasible, silver for the food would save money and make eating easier and the planet cleaner. 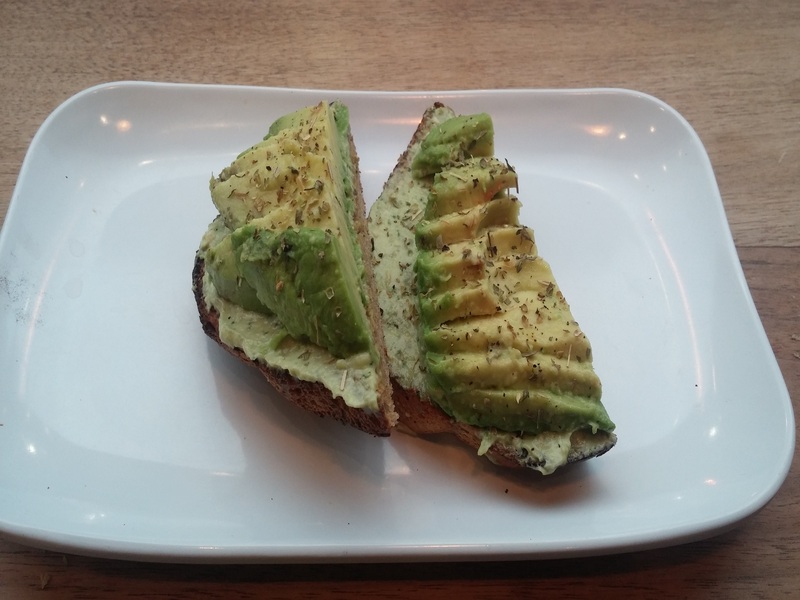 I’m not a huge avocado toast fan and I haven’t had much of it but as far as avocado toast goes, this is probably as good as it gets. The basil pesto distinguishes it from any other avocado toast. It bursts. I am, however, a juice connoisseur. I make my own fresh juices and have frequented many juice bars. I drink all green juices and find it easy to detect quality and freshness versus a flat taste. All Greens contains cucumber, celery, spinach, swiss chard, kale, parsley, and cilantro. I figured it would be run of the mill. 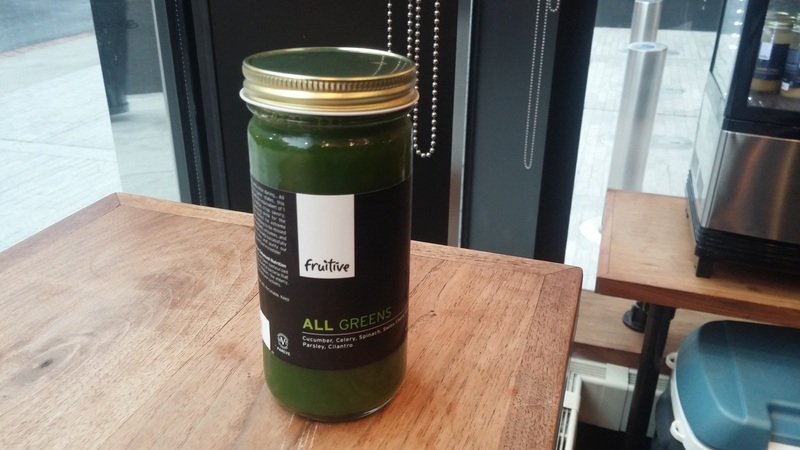 But then I found out that in addition to being the first certified organic fast-casual restaurant in North America, Fruitive buys its greens from local farmers who prioritize nutrient-rich soil. The greens were robust and tasted nutrient-dense as if they had just been picked from a garden. The juice far exceeded expectations. But having just had the best waffle, could this also be the best green juice? It’s not an honor I would award on a whim. Indeed, it was. First place–again. Fruitive is beautiful in more ways than one. The look is unique and the branding is hip. It turns out Gregg previously worked as a contractor and it shows. The spot is super comfortable although the space is small and seating is limited. They have some room to add more tables if they reconfigure their refrigerated juice stations and make better use of an area with cozy bookshelves. Ryan, the manager, had a checklist in her mind of everything she needed to do during my visit–and she didn’t miss a beat. She engaged me, offered good suggestions, and provided samples. She also checked on me during and after the meal. After I finished, an employee promptly cleared my completely empty plates. They’re on their game at Fruitive–attentive, professional, cordial, and invested. When I asked Ryan about the charitable work they do with food banks, she was eager and proud to discuss it. It’s always inspiring to see small businesses supporting their community. I suggested to Ryan that instead of donating a percentage of sales to food banks, she should donate Fruitive food because it’s healthy, eco-friendly, and kind. Unfortunately, many food banks don’t provide good food. She liked the idea and thanked me for the suggestion. It’s never necessary to harm an animal to feed a person. It’s always well-intentioned but never makes sense given the availability of plant-based options. I returned later in the day and bought five more All Greens juices to go. There are no shortage of juice bars in DC. I could have gone anywhere. I returned because I had a positive experience. And I’ll go back time and time again and refer everyone I know in the area. That’s the power of quality customer service. It’s make or break. Even if the food was good, I wouldn’t return if the experience didn’t match it. Too many other choices. The food was delicious and reasonably priced, the ambiance was perfect, the service was fast, the manager was off the chart, and the mission is as good as it gets. Put this place on the top of your list when you’re in D.C. Fruitive is the vegan Neverland. The restaurant reviews are great! Very informative and the pictures help me savor the description. Thank you Denise! I appreciate your note.